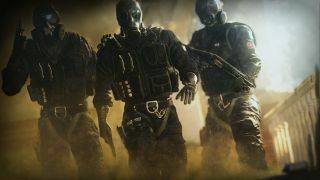 Ubisoft has released an "interactive trailer" for Rainbow Six: Siege's recently revealed Terrohunt mode. The interactive element is perhaps being a little oversold. It's little more than the option to click on the screen as a man jumps through a window, triggering a text box pop-up that explains the concept of jumping through a window. More useful is the chance to see Ubisoft's brand of Very Professional Gamer tackle a section of the Human vs AI mode. Make sure to full-screen the embed above so as not to have the action covered by the subtitles of serious men doing serious war things. For more on Terrohunt, see Wes's hands-on impressions and footage. Rainbow Six: Siege is out October 13.